The Gurus mentioned the performance of selfless service on the part of a disciple as the first step in Sikhism. By doing service of various kinds without payment or any expectation of reward, one acts as a Sewak, or Sewadar. From this may spring humility and the consequent elimination of one's ego in this way, God's "Name" can best enter an humbled mind. One should have an absolute faith in the Guru; he must surrender himself to follow the code of self-discipline as laid down by the Gurus. Voluntary service can be of different kinds - with body, mind and money. Apart from serving Sangat(Congregation) one is also expected to serve one's family members, relations and the community. One may help in cash or kind, to deserving persons and charitable organisations. Then comes service with the mind, such as is required for reflection on Gurbani and the remembrance of God's Name - All these forms of service are recommended by the Gurus. They also warn us that service must be done gladly and without any motive for compensation. It has not be done with a secret or hidden ideas to win approbation, honour or position. These defeat the main object of "service" which is to eliminate the ego. Unfortunately, most Sikhs do little sewa, but expect a big return for what they do such considerations are unbecoming for True Disciples. The Gurus have enumerated various benefits from doing selfless service. One may obtain inner happiness and real honor. As one learns to be humble and associates with holy person, and progresses on the spiritual path, so one may come to worldly success. Sikhism, requires a Sadhana - an effort towards the spiritualising of the self. 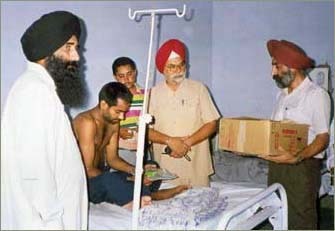 All the Gurus performed various kinds of voluntary service, both inside and outside Sikh institutions. The Sikhs then followed in their foot-steps; we have examples of the services of Bhai Manjh, Bhai Hindal and Bhai Kanhaiya, to name but a few. Even today, we find various kinds of service organisations run by the Sikhs in India, like orphanages, widows' homes, institutes for the destitute and the handicapped, like the Blind school. The important question to ask oneself is: "What service can I do?" The answer depends on one's own abilities and inclination. One may serve in any field in which one is interested. Any service, is a step on the path of Sikhism, provided it is done in sincerity and without thoughts of the self. 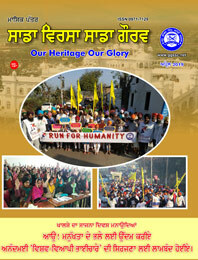 "GGSSC initiated a few sewa projects to help the needy people"